Oklahoma is a state synonymous with cowboys and Native American culture. While it may lack the rugged canyons and pastel skies of New Mexico or Arizona, Oklahoma's identity is distinct and very much a legacy of the Old West. Today, Oklahoma has the second largest Native American population in the United States and also has a strong African-American heritage. Both of these populations provide visitors with rich cultural history and experiences. Encounters such as powwows, craft festivals, and traditional storytelling all signify the great cultural history of Oklahoma. Events also pay homage to the cowboys of history, with more than 100 rodeos taking place in Oklahoma each year in which modern cowboys compete in calf-roping, steer-wrestling, and bull-riding events. The flat, fertile land of the central region is only one part of Oklahoma's diverse terrain. In the east, the prairies give way to rugged mountains and dense forests. This region, today a favourite of rappelling enthusiasts, hikers, and equestrians, was once a favourite of outlaws as well. Robbers Cave State Park served as a hideout for such notorious fugitives as Jesse James and Belle Starr. 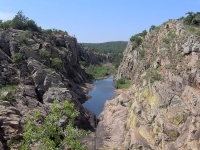 The Broken Bow area is also popular with lovers of the outdoors, while fly-fishing and boating opportunities also make it a top holiday spot. In the north, the grasslands shift again into one of Oklahoma's most intriguing natural wonders: the Great Salt Plains, a literal 8,690-acre sea of salt. In the west lie the Beaver Dunes, where adventurous visitors can rev up dune buggies or ARVs and race down sandy slopes. Oklahoma as a whole is conservative and inspires nostalgia for a simpler life, precluding pretence or sophistication. The solemn nature, vision, and sensitivity of the Oklahoma City National Memorial and Museum Visitors is testament to this, established in honour of those who died in the 1995 bombing. Those in search of travel kitsch will find landmarks in roadside architecture, including the Blue Whale and Totem Pole Park. There are also well-preserved architectural gems, remnants of the Oklahoma oil boom of the 1920s and 1930s.